Since writing my last post on Calendula a few days ago, I’ve been noticing even more than usual how cheerily beautiful these flowers are. In fact, every time I walk through the garden I stop to appreciate their intensity of colour, which like the sun, rather than detracting from the other softer-hued blooms, seems only to enhance their radiance. However it has come to my attention of late that many gardeners consider orange flowers some thing of a faux pas. Perhaps seen as garish and lacking in modesty amongst the gentle pinks, blues and whites of many popular garden flowers, several writers I have been reading recently seem to have taken against the use of orange in the garden. Even the equally exuberant yellow and red flowers get a better press than the orange. Well call me tasteless, lacking in class or otherwise aesthetically impaired if you will but I adore orange flowers. Some of my favourite bits of the garden are populated with orange. 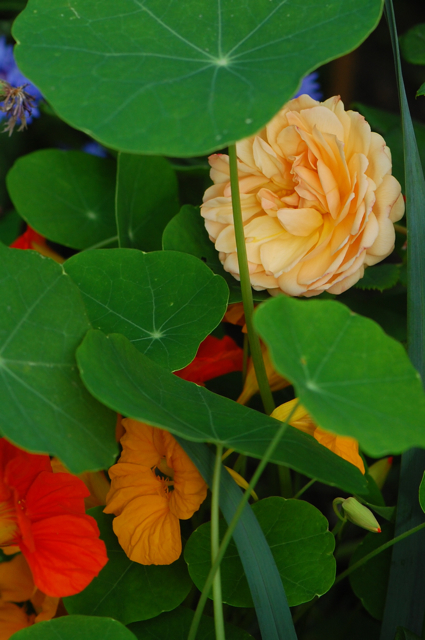 Like these nasturtiums and Californian poppies. 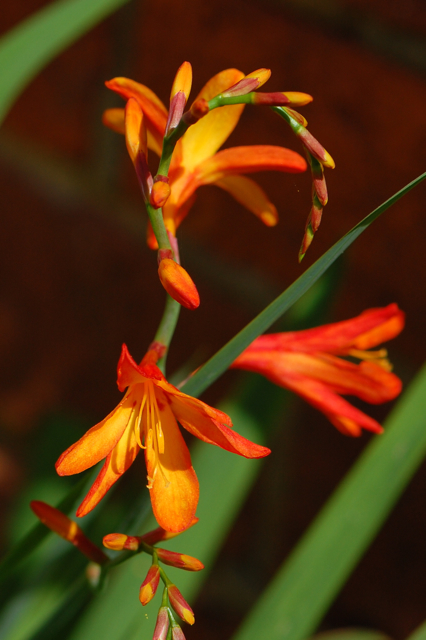 I also love these little crocosmia, the only flower that was already in the garden when we moved in. Those who read this blog regularly will have heard me rave about my lovely little rose ‘Warm Welcome’ and I’m getting much pleasure from the softer apricot tones of ‘Lady Emma Hamilton’ too. 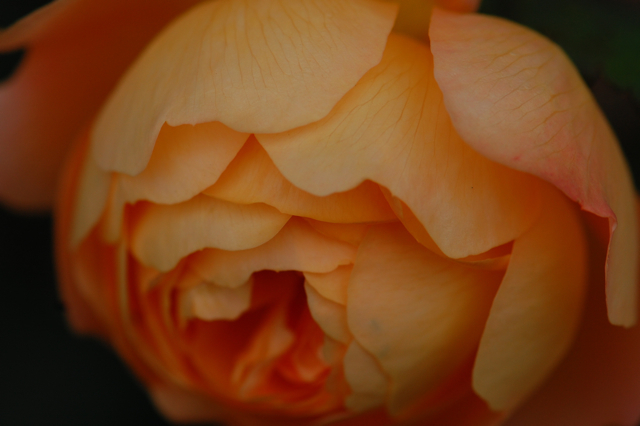 I think the vibrant hued oranges blend beautifully with softer shades like this creamy peach rose with the nasturtiums. 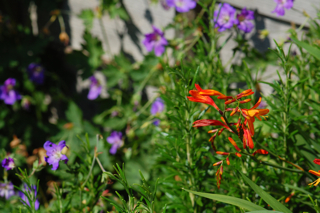 I love planting oranges alongside mauve or blue flowers, like the crocosmia with this blue geranium. I think I get this from my Dad who always grew mountains of love-in-a-mist with Californian poppies. And to make matters worse, I even like oranges and pinks together! When it comes to matters of taste, it seems there’s no hope for me at all. 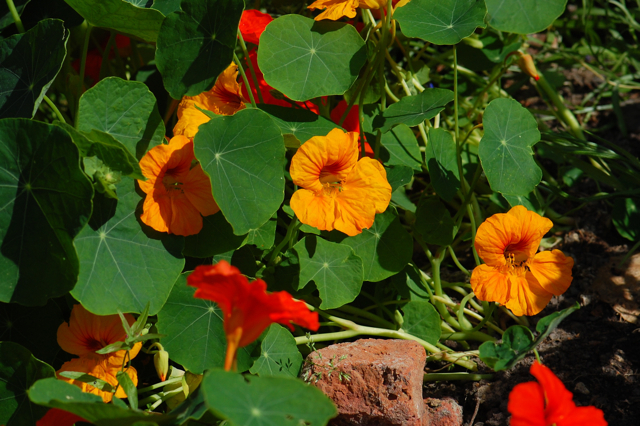 Here, in spring in Western Australia, my garden is being taken over by Nasturtiums, and I love them! Apart from the fact that you can’t kill ’em with an axe (great for dodgy gardeners like me), they are so vibrant and happy, and they look gorgeous against my blue painted fence. The only problem is they tend to crowd everything else out, then die off in high summer leaving the garden looking rather sad, but I still think they’re wonderful. I’ve never planted a single one, and yet they come up faithfully every year to cheer up my garden. 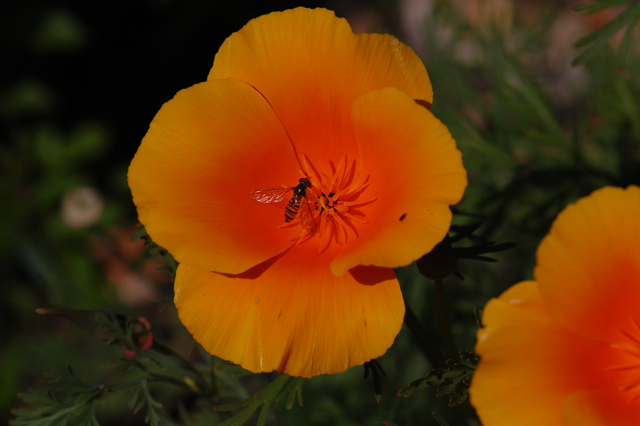 Oh, and I have California poppies everywhere too! Some of the best plants are the ones that just appear I think! 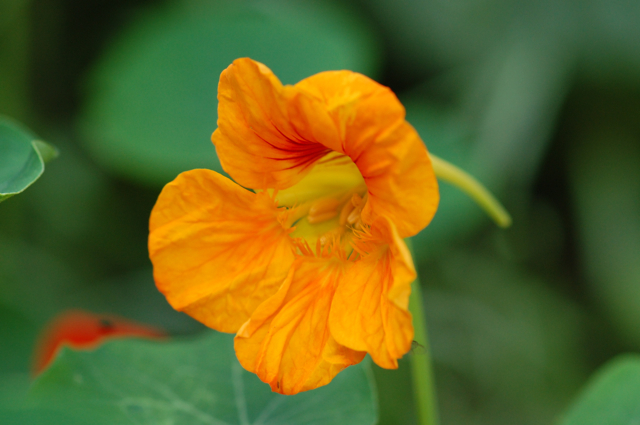 I can imagine the Nasturtiums looking stunning against a blue fence, they are so cheerful aren’t they, I put the flowers on top of all my meals in the summer and they make everything look special. Thank you for such a beautiful heart felt site. I love your orange flowers. Have just made Hawthorn berry tincture….thank you! Oh wonderful. The hawthorn berries are particularly fabulous this year aren’t they. Thank you for your lovely comment. I have a confession……..I used to loathe orange. Over the years I gradually added Calendula, Lillies, Oriental Poppies, and others. I am learning to love orange. 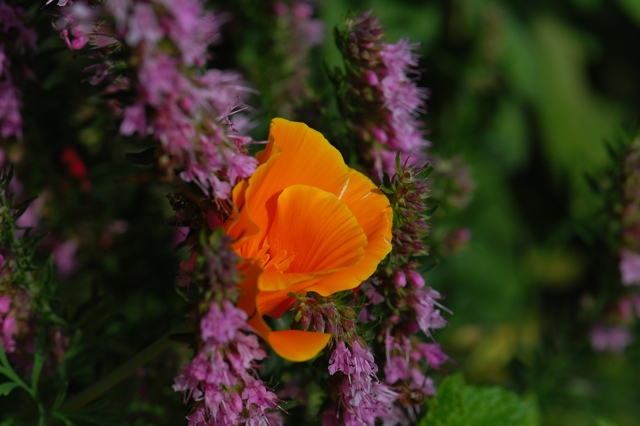 I love Calendula and Nepeta together…….it is a beautiful combination. All colours have something to offer a garden. BTW love your plantings and colour combinations…..
It’s funny, orange does seem to really offend some people, I’m glad you are learning to love it with the help of your gorgeous grandson! Calendula and Nepeta sounds like a wonderful combination. I will have to try it out next year. Just wanted to drop by and thank you for the beautiful tree poem. It touched my heart……. I love orange flowers, too; they seem to find me, even when I think I’m planting something of a different color! 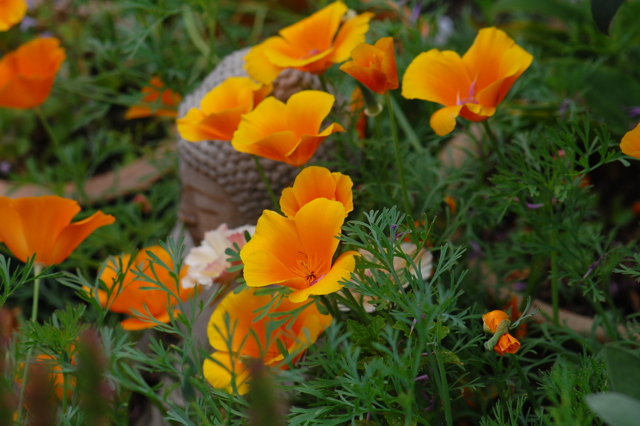 Who could think that nasturtiums and California poppies aren’t cheer-invoking? I love that everything you plant comes up orange, you must be a very sunny person inspiring the nature around you to be so vibrant! Hmm call me tasteless as well then as I have particularly loved the nasturtiums and calendulas in the garden this year! We had a particularly gorgeous set of cultivar calendulas – still calendula officinalis, but with deep orange, close set petals with rusty red tinges. They were absolutely stunning, made a great infused oil and really worked beautifully alongside the rest of the garden plants! 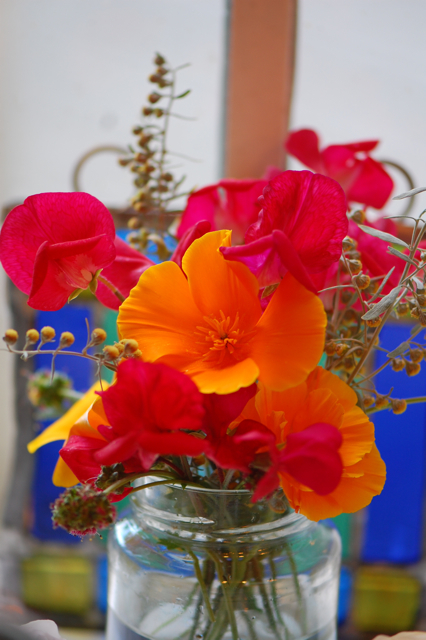 Next year I am going to have another go at growing californian poppies – they failed dismally this year unfortunately. The calendulas are still going strong, but are starting to die back – the only real flowers in the garden at the moment are those of the yarrow and tansy, which will probably still be kicking around at the end of the month. It was absolutely wonderful meeting you the other day and I really enjoyed your talk on external uses of herbs! If you live reasonably close, we could maybe meet up sometime and swap cream recipes? I’m glad to see I’m not alone in my tasteless ways! Those calendulas sound lovely, I’d love to see a picture of them if you have one. I think we live quite far apart but it would be lovely to meet if the opportunity arises. You’re in Lincoln no? I’m down on the coast near Brighton. Let me know if you are ever in this neck of the woods and I will do likewise! How did I miss this bright cheery post!?! 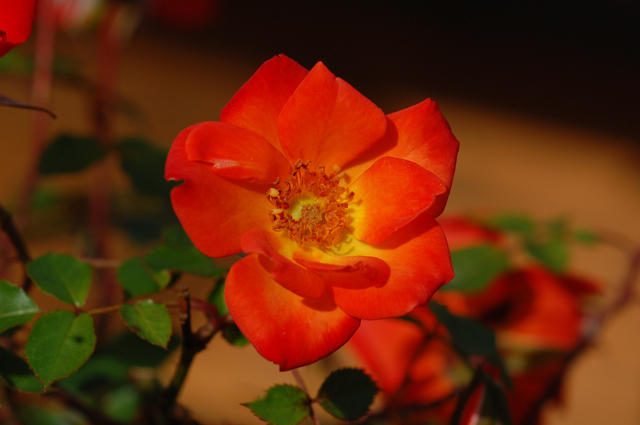 I love what you say about the bright orange hues enhancing the radiance of the more subtle flowers – so true! I do love a good bit of orange myself, and was just out taking in the heart warming radiance of my calendula patch in the lovely afternoon light. 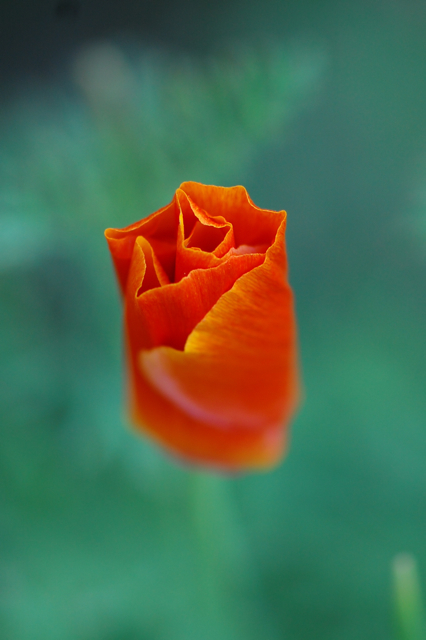 I love the photo of the California poppy just ready to unfurl – it looks so cozy, as though wrapped up in a warm jacket on a cold day. Also love your beautiful and vibrant flower arrangement in the end. Here’s to celebrating orange! We finally got rid of the old parking spot which was full of rubble from the front of our house and I plan on having more calendulas (and roses of course) so I can harvest plenty for oils, teas and tincture. I’m thinking about colonising the flat roof next unless my name comes up on the allotment list soon. Though I’m not sure it’s up to the strain! .Our property was seeded in glowing golden-orange California natives over a decade ago and they have come .back strong every year since.